Facebook is facing a new kind of existential threat, not from competitors, but rather from an adversary who can neither be acquired nor competed against: governments, particularly in Europe. The decision by Damian Collins, a British lawmaker, to publish highly sensitive, unredacted internal Facebook emails is aggressive, uncompromising, and further intensifies the European battleground — an arena where Facebook has little to no political support. Facebook has faced such threats domestically, and has responded by hiring attack dogs in D.C. It also has on its side Facebook-friendly senators like New York's Chuck Schumer. Europe has few equivalents. The emails published by Collins could not be published in the U.S., where they are under a court-ordered seal. But Collins is not subject to U.S. jurisdiction, and happily sent the U.K.'s Serjeant-at-Arms to demand the material. The gambit was legally dubious, but it worked. The lesson, for Zuckerberg: Foreign adversaries do not play by U.S. rules. Facebook was already facing a formidable threat in the form of Margrethe Vestager, the EU's competition commissioner. After all, Facebook already comprises half of a duopoly controlling 75% of the digital advertising market, and it's growing fast. Calls to break it up are being taken increasingly seriously. Internally, Facebook considers itself to be a business, acting as businesses do. Mark Zuckerberg's defense, in large part, boils down to "Running a development platform is expensive," in a world where Facebook needs to make money. But the company is grappling with a growing trust deficit with its users — the people who elect politicians like Damian Collins. Facebook's sheer size and influence over global communication has made governments want to check its power. In the U.S., such behavior can be defended as healthy, red-in-tooth-and-claw capitalist competition. To European eyes, however, it looks anti-competitive. There's a fundamental difference in how regulators view monopolies (and duopolies) on either side of Atlantic. U.S. antitrust law evaluates monopolies in terms of potential direct harm to consumers, such as rising prices as a result of a firm's dominance. Simply being a monopoly is not illegal. In Europe, regulators act to preserve competition, whether or not there is evidence of direct consumer harm. The bottom line: Zuckerberg has made an enemy of European lawmakers, who have a fearsome arsenal. 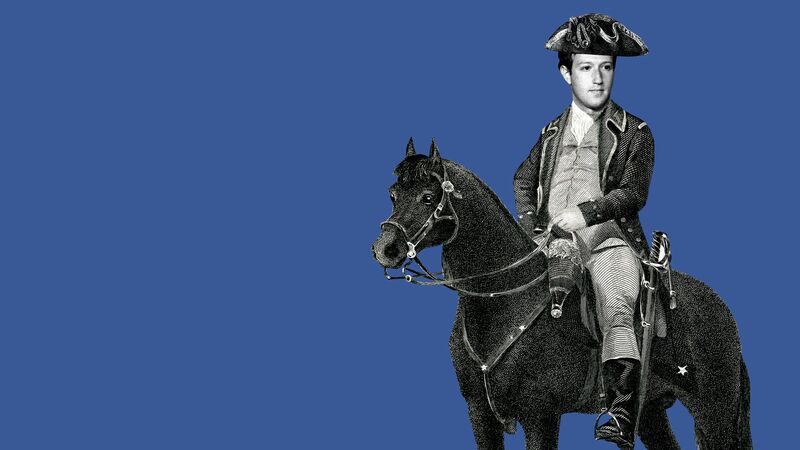 The Facebook documents released by a British lawmaker yesterday portray the company as a ruthless corporate giant that will do whatever it takes to squeeze out competitors and increase user engagement with its products, Axios' Sara Fischer reports. Why it matters: Some analysts began downgrading Facebook stock in the wake of yesterday's drama. Facebook says the provider of the documents "cherrypicked" the evidence as part of a lawsuit years ago. Be smart: While the documents give important context into how Facebook executives operate and make decisions, it's unclear whether they expose any illegal practices. Naïveté about data leaking: An email shows a former Facebook VP of product management saying he was generally skeptical there was as much strategic risk in data leaks between developers (like what happened with Cambridge Analytica). Value of friends’ data: Facebook executives discussed requiring developers to buy ads in order to access users’ personal information as an opportunity to monetize their developer relationships. Targeting competitor apps: An email exchange shows Mark Zuckerberg approving a decision to shut down Vine's access to friends via Facebook for the purposes of undermining its success as a video competitor. "I understand there is a lot of scrutiny on how we run our systems. That's healthy given the vast number of people who use our services around the world, and it is right that we are constantly asked to explain what we do." "But it's also important that the coverage of what we do — including the explanation of these internal documents — doesn't misrepresent our actions or motives." "Ned Davis Research puts markets into eight big asset classes — everything from bonds to U.S. and international stocks to commodities. And not a single one of them is on track to post a return this year of more than 5 percent, a phenomenon last observed in 1972." Why it matters: "Market statisticians are falling over each other in 2018 to describe the pain being felt across asset classes." "Slowing economic growth, shrinking central bank balance sheets and continued bouts of volatility will help make 2019 another poor year for risk-adjusted investment returns, with few obvious havens, according to Goldman Sachs Group Inc."
"The locomotive was painted to resemble Air Force One ... 'I might have left Air Force One behind,' [former President George H.W.] 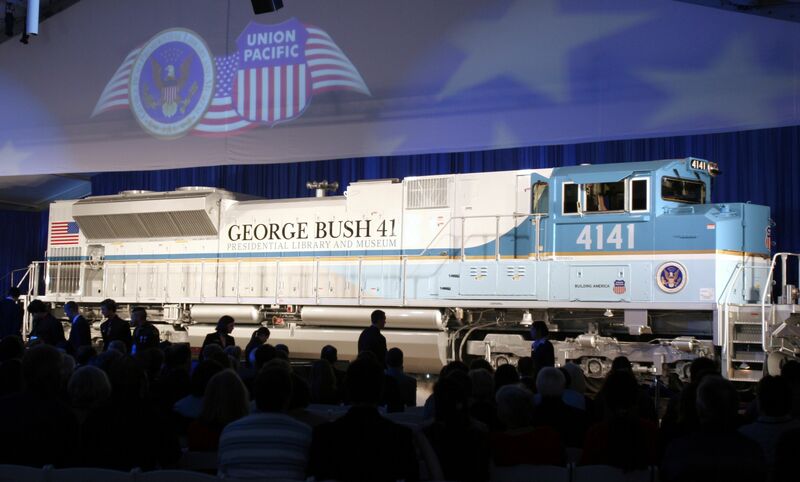 Bush quipped during the 2005 unveiling of 4141, a blue and gray locomotive," AP's Will Weissert writes. Today, "that same 4,300-horsepower machine will carry Bush's casket, along with relatives and close friends, for around 70 miles." "The journey through five small Texas towns was expected to take about two and a half hours. It will deliver the casket from suburban Houston to College Station." 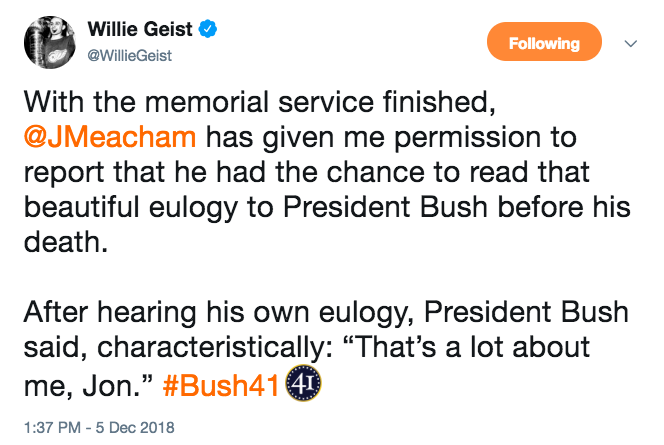 "There, a motorcade will take Bush to his presidential library at [Texas A&M], where he will be laid to rest at a private ceremony next to his wife, Barbara, who died in April, and his daughter Robin, who died at age 3 in 1953." 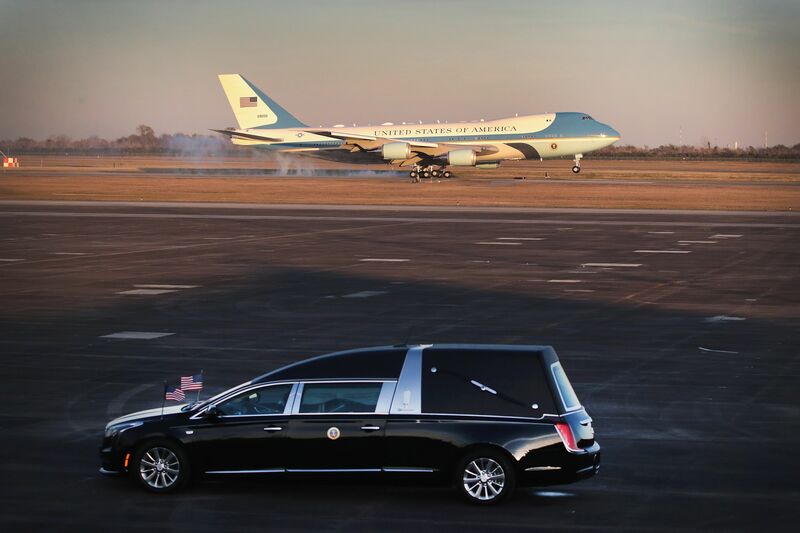 "The train's sixth car, a converted baggage hauler called 'Council Bluffs,' has been fitted with transparent sides to allow mourners lining the tracks on Thursday views of Bush's flag draped coffin." "It will be the eighth funeral train in U.S. history and the first since Dwight D. Eisenhower's body traveled from the National Cathedral in Washington through seven states to his Kansas hometown of Abilene 49 years ago." "Abraham Lincoln's funeral train was the first, in 1865." "Union Pacific originally commissioned the Bush locomotive for the opening of an exhibit at his presidential library titled 'Trains: Tracks of the Iron Horse.'" "It was one of the few times the company has painted a locomotive any color other than its traditional yellow." "After a brief training session during 4141's unveiling 13 years ago, Bush took the engineer's seat and helped take the locomotive for a 2-mile excursion." "Union Pacific was contacted by federal officials in early 2009 and asked, at Bush's request, about providing a funeral train." "[T]rains were the mode of transportation that first carried Bush to his service as a naval aviator in World War II and back home again." Bush once recalled how he took trains, and often slept on them, during trips as a child with his family: "We just rode on the railroads all the time, and I’ve never forgotten it." 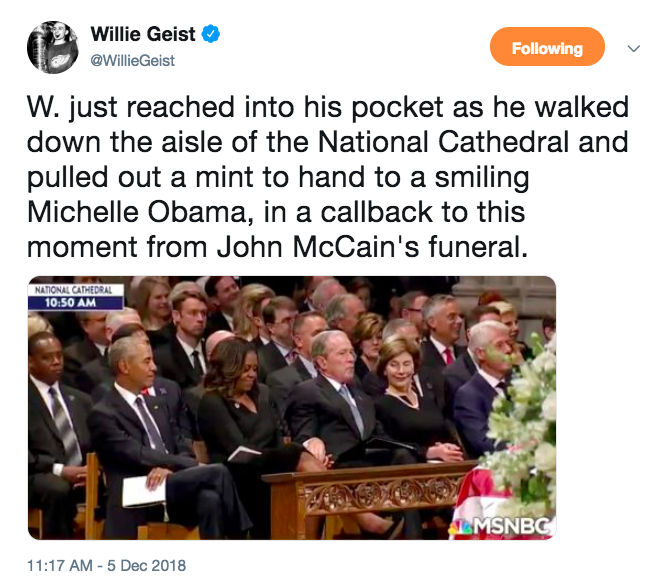 "What does it tell you that the feel-good events in Washington these days are funerals?" The remains of President George H.W. Bush touch down at Ellington Field in Houston, Texas. 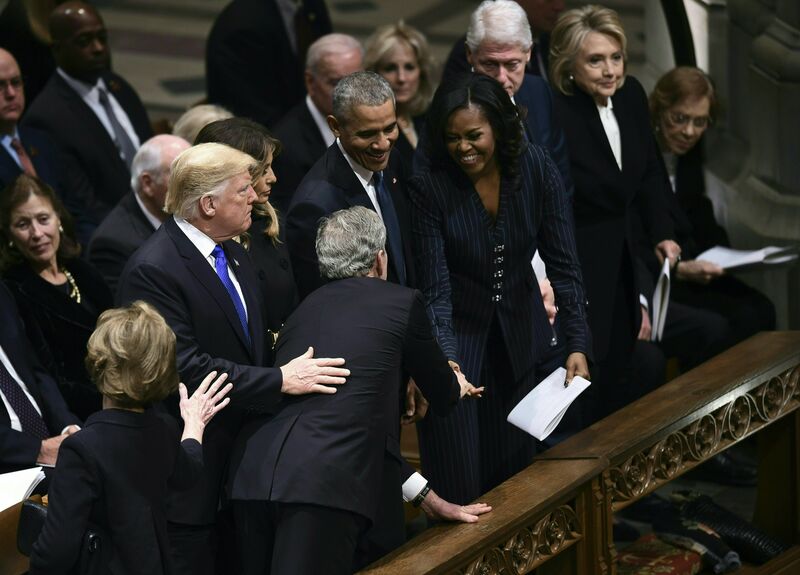 Below, former president George W. Bush (with Laura Bush behind him) reaches across President Trump, First Lady Melania Trump and President Barack Obama to greet Michelle Obama. That's Rosalynn Carter on the end. "[N]one of that kept him from the leveling end that awaits even the most vigorous and clever wielders of power." The cannon boomed; the rifles popped, the polished wooden coffin sank into the wet ground. Chilled, the mourners hastened across the green grass to a gathering where canapes were served by uniformed staff." "And though their smiles returned, the end of power lay before them, down the path, beneath the trees, under the ground." Why it matters: Silicon Valley has stabilized its relationship with Trump, finding ways to work with the administration as many other industries do. The administration’s policy apparatus has handed the industry wins on some key issues — even if the president still fires off critical tweets. 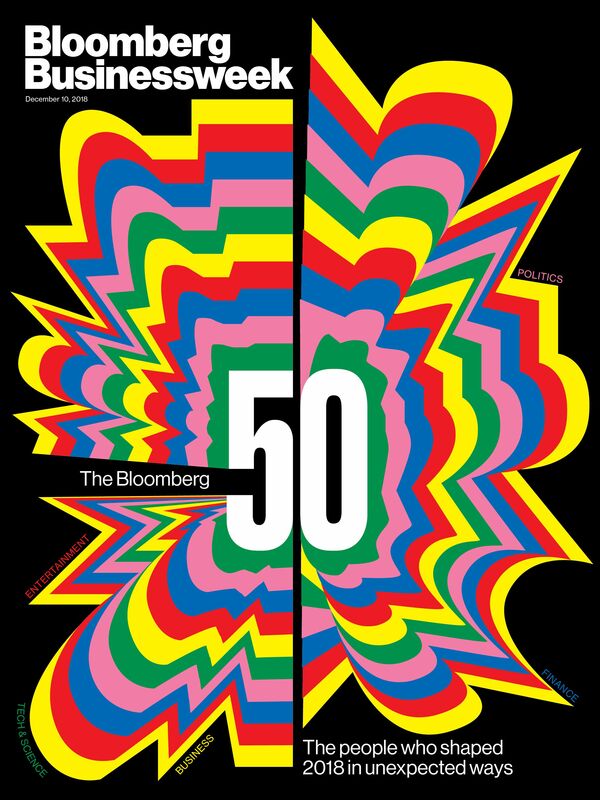 Chief executives at today's meeting are expected to include Google’s Sundar Pichai, Oracle’s Safra Catz, IBM’s Ginni Rometty, Microsoft’s Satya Nadella and Qualcomm’s Steve Mollenkopf. Tech has notched some wins. The industry has benefited from the new tax law and seen victories from the White House on wonkier priorities, like government IT modernization and protecting websites that host content online from liability in the proposed new North American trade agreement. The White House now has a roster of tech allies. Many of the attendees have made a point of working with the White House and doing business with the government. Oracle and IBM regularly seek government contracts. Microsoft just signed a big deal with the Defense Department. And Qualcomm had a big win when Trump squashed Broadcomm’s attempt to take over the chip maker. Administration officials are more wary of tech regulation. Former internet industry lobbyist Gail Slater used her position at the White House to launch a process to counteract strict privacy rules coming out of California and Europe — a potential win for industry. A senior official’s proposal earlier this year to nationalize a 5G network has given way to meetings featuring pro-industry rhetoric about expanding wireless networks. Our thought bubble: This relationship has proven especially fraught because of the divide between the White House and many people in tech on issues like climate change and immigration. "Laurie Pressman, the company's vice president, [says] this saturated orange base with a golden undertone [is] not only warm and welcoming but versatile and life-affirming. 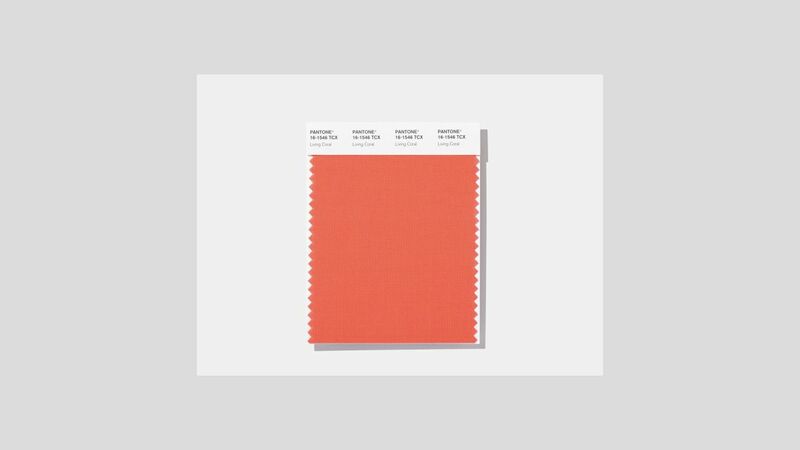 It energizes with a softer edge than, say, its pastel and neon color cousins." "With everything that's going on today, we're looking for those humanizing qualities because we're seeing online life dehumanizing a lot of things," she said. "We're looking toward those colors that bring nourishment and the comfort and familiarity that make us feel good. It's not too heavy. We want to play. We want to be uplifted." Pressman also sees a retro vibe to Living Coral: "It's the emotional nourishment. It's a big hug."